Jerusalem District Police Commander Major-General Yossi Parienti has informed the Women of the Wall organization that from now on they will be forbidden to recite the Kaddish prayer at the Western Wall plaza – in addition to the prohibition to wear a prayer shawl and read the Torah. Ahead of the group's monthly prayer event scheduled for next Thursday, the first day of the Jewish month of Iyar, the commander sent a letter to Women of the Wall Chairwoman Anat Hoffman, stating that the police planned for the first time to enforce the law according to a strict interpretation offered by the Justice Ministry in 2005. An opinion released at the time by Attorney Yaakov Shapira of the Ministry's legislation department, after conferring with director of the department for High Court petitions Osnat Mendel, stated that the prohibition issued by the court against the women's practice at the Western Wall, also includes a quorum of women saying the Kaddish prayer. According to Major-General Parienti, a discussion held last month with Deputy Attorney General Sarit Dana determined that the instructions issued seven and a half years ago were "completely valid," and therefore "starting at the beginning of next month, the Israel Police will fulfill their duty to enforce the law. "If the Women of the Wall seek to change the fixed arrangement, they are free to take this matter to the authorized officials," the district commander quoted Attorney Dana as saying. "As long as the arrangement has not been changed – we must act according to what has been determined in the court ruling." He concluded with a quote from Attorney Yaakov Shapira's opinion: "I pray that the aforementioned will prevent unnecessary conflicts, and that truth and peace will prevail." According to Hoffman, the reciting of Kaddish by women is acceptable all over the Jewish world, including in Orthodox circles, and revoking it on the start of the month of Iyar – which includes the Holocaust Remembrance Day, the Day of Remembrance for Israeli Fallen Soldiers and Independence Day – is particularly infuriating. "These are days which symbolize more than anything the unity around a shared Jewish fate and the personal and national price paid by each and every one of us," she argued. "Preventing bereaved mothers and women from saying Kaddish is callous and uncompassionate." The Jerusalem Police declined comment. Attorney Yizhar Hess, CEO of the Masorti Movement in Israel, said in response to the police's announcement that the Western Wall rabbi, "who instructs the police to listen to the women's prayers for fear that they would – God forbid – say Kaddish, treats the Western Wall as his personal synagogue." He added that Rabbi Shmuel Rabinowitz's rabbinical opinion, supported by the police, cannot punish the Women of the Wall for finding a place within the public's heart. Rabinowitz nevertheless stated Thurdsday that police would not arrest women who would recite the Kaddish prayer in the Western Wall, despite Parienti's statement. 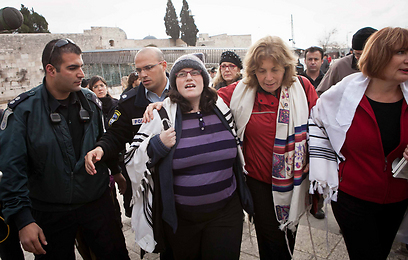 Dozens of members of the Women of the Wall group have been detained in the past six months during and after their prayer events. The latest prayer, about three weeks ago, was attended by female Knesset members. Jewish communities abroad are following the events with great interest, and Prime Minister Benjamin Netanyahu recently turned to Jewish Agency Chairman Natan Sharansky in an effort to reach an agreement that would end the dispute over the Western Wall's religious nature, so that each and every Jew would be able to visit and pray at the site according to their faith. In January, the battle reached the Supreme Court when the Israel Movement for Reform and Progressive Judaism, women's organizations and various pluralistic movements petitioned the High Court of Justice. See all talkbacks "Police ban Kaddish by women at Kotel "